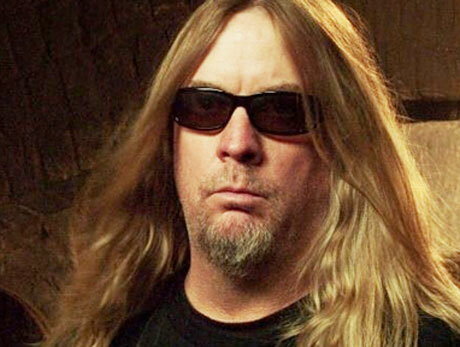 Founding Slayer guitarist Jeff Hanneman passed away last week after suffering liver failure. While some had thought the death was related to the 49-year-old's battle with necrotizing fasciitis (aka flesh-eating disease), which he contracted from a spider bite, an autopsy reveals that his death was actually alcohol related. We've just learned that the official cause of Jeff's death was alcohol related cirrhosis. While he had his health struggles over the years, including the recent Necrotizing fasciitis infection that devastated his well-being, Jeff and those close to him were not aware of the true extent of his liver condition until the last days of his life. Contrary to some reports, Jeff was not on a transplant list at the time of his passing, or at any time prior to that. In fact, by all accounts, it appeared that he had been improving — he was excited and looking forward to working on a new record. The post also states that Slayer are planning a public event sometime later this month to celebrate Hanneman's life. Kerry King and Tom Araya go on to share their favourite memories of Hanneman. To read the whole post, go here.